In Dec 2015, there were unprecedented rains in Chennai ~ water ran over Saidapet, Adyar bridges, many houses were inundated – people suffered – the devastation was captured and shown widespread in every media; social media highlighted more and there were so many groups including SYMA of Triplicane that were involved in relief work. On Nov 5, 2018 - a low pressure system formed over the Gulf of Thailand. The system crossed through Southern Thailand and the Malay Peninsula on Nov 8. The next day, it crossed into the Andaman Sea and lingered there, organizing further throughout the day and intensified into a depression over the Bay of Bengal on November 10. The next day, the system was designated by the IMD as BOB 09. Soon after, the Joint Typhoon Warning Center (JTWC) issued a Tropical Cyclone Formation Alert (TCFA). 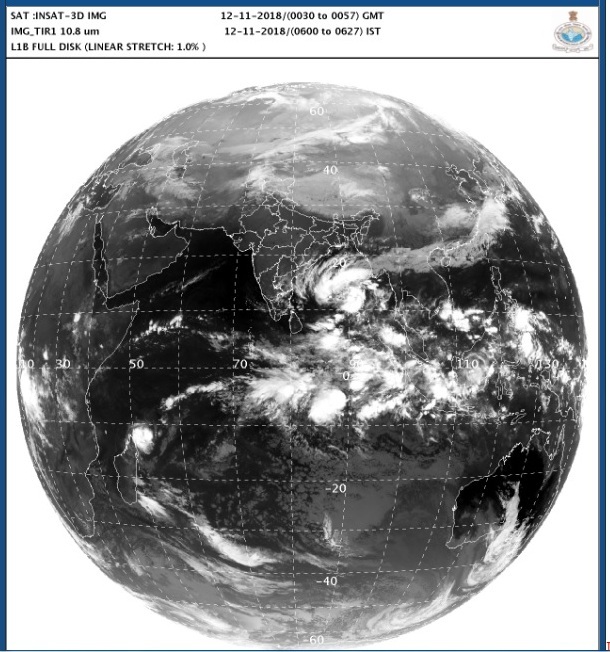 At 00:00 UTC on November 11, the deep depression strengthened into a cyclonic storm, and was named 'Gaja'. There was red-alert too .. .. it made a landfall later – there were not even heavy rains in Chennai and social media made memes making fun that ‘Gaja went jaga’ – it became a joke .. .. .. first regret for not realizing the devastation caused elsewhere in our own state of Tamil Nadu .. ..
Gaja made landfall along the coast of Tamil Nadu as a severe cyclonic storm between Vedaranyam and Velankanni shortly after midnight on 15.11- it reportedly was more than 120 kmph at the eye of the storm. The Atmospheric Infrared Sounder or AIRS instrument aboard NASA’s Aqua satellite passed over Tropical Cyclone Gaja on Nov. 15 at 3:29 p.m. EDT (around 2 am IST) and analyzed the storm in infrared light. Infrared light provides temperature data and that’s important when trying to understand how strong storms can be. The higher the cloud tops, the colder and the stronger they are. When Aqua passed over the Indian Ocean, Gaja’s center was making landfall along the coast of southeastern India. 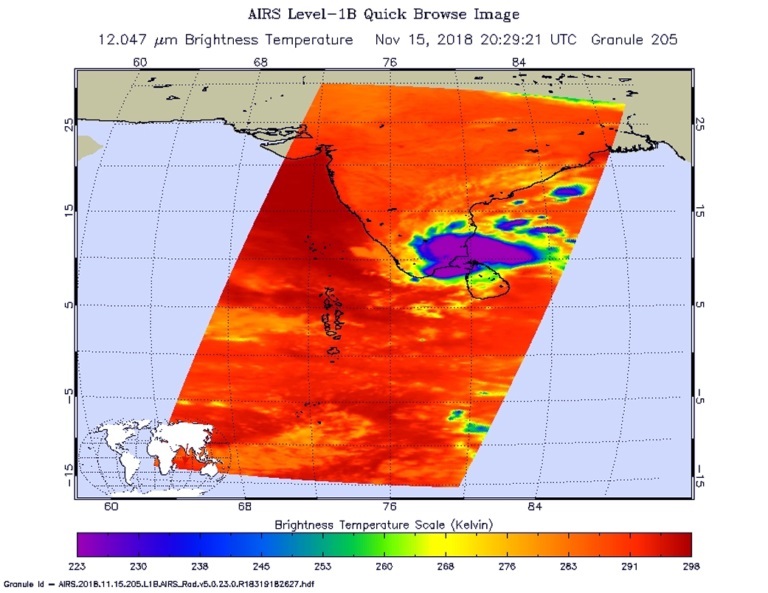 The AIRS instrument found coldest cloud top temperatures in thunderstorms around the center, where temperatures were as cold as minus 63 degrees Fahrenheit (minus 53 degrees Celsius). Storms with cloud top temperatures that cold have the capability to produce heavy rainfall. 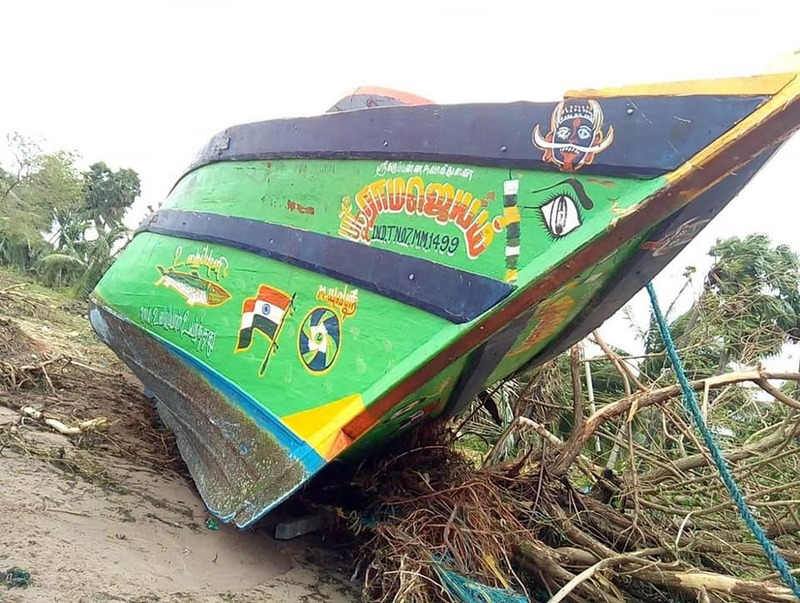 It appears that – we have not fully understood or realized the havoc caused by the cyclonic storm 'Gaja', which crossed Tamil Nadu's coast early on Friday, claiming more than 20 lives and thousands of cattle. 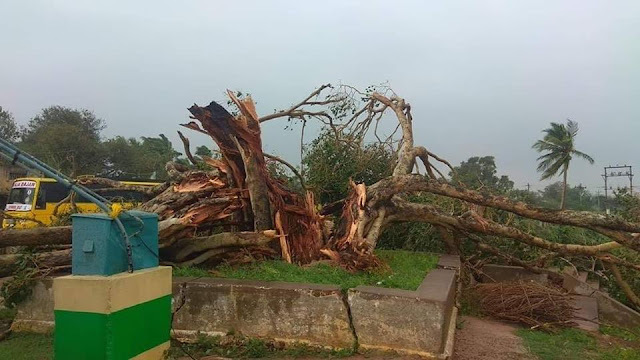 The winds due to the cyclonic storm resulted in hundreds of trees and electricity poles being uprooted in places of : Nagapattinam, Vedaranyam, Pattukottai, Karaikal, Thanjavur, Thiruvarur, Pudukottai, Cuddalore, Pudukottai to name a few. Thanjavur is the delta region, that produced quintals of paddy when Cauvery was in full flow. Tanjore district encompasses the entire cauvery delta. For administrative reasons the erstwhile Thanjavur district was divided into three districts Viz. Thanjavur, Thiruvarur and Nagapattinam districts. The sad news is - Cyclone Gaja has left coconut farmers devastated, felling lakhs of trees in groves across the Cauvery delta and in neighbouring Pudukottai district. 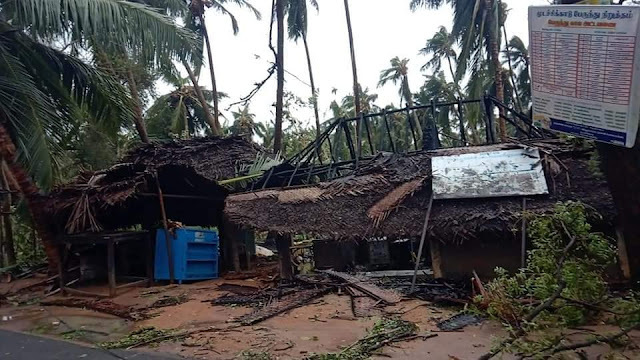 “The impact created by cyclone Gaja certainly is deeper than we could imagine. Livelihoods of thousands of villagers have been destroyed. 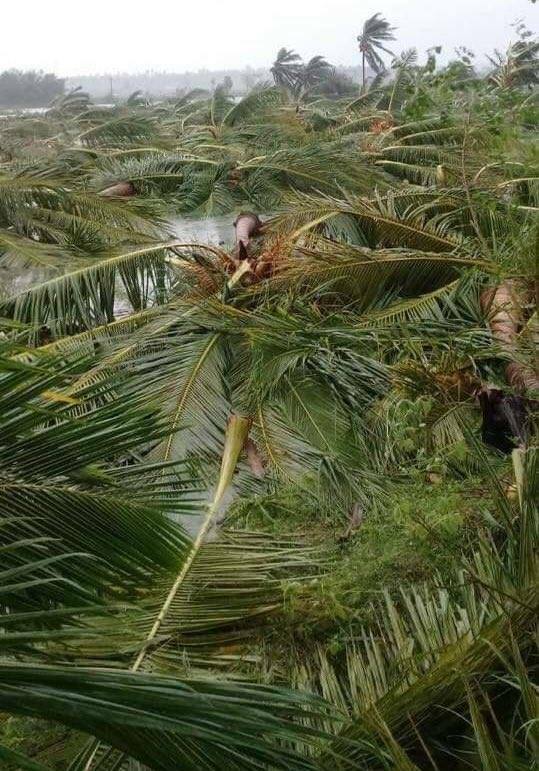 The coconut growing belt of Pattukottai and Peravurani in Thanjavur district have been the worst affected, farmers say. The Agriculture Department has launched a survey to enumerate the extent of damage and it is expected to be completed by November 25. Coconut is raised on about 40,000 hectares (ha), mostly in Pattukottai, Peravaruni and Orathanadu areas in Thanjavur district, the department officials said. According to initial estimates, over five lakh coconut trees in Pudukottai district have been uprooted by the cyclone, leaving coconut growers literally in tears. 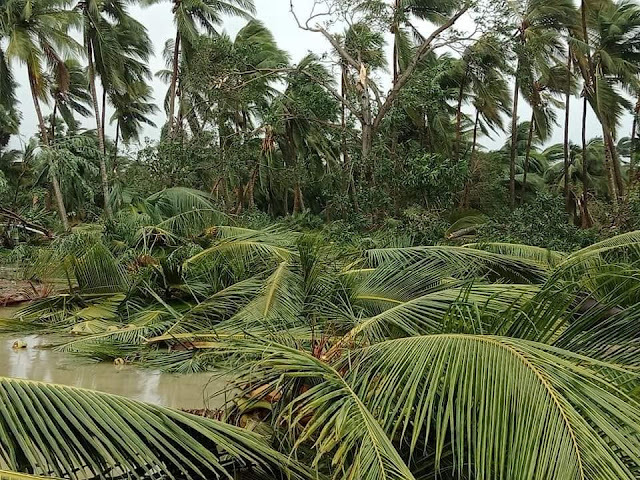 Authorities in Nagpattinam said that coconut trees on 3,000 hectares have been damaged. Farmers of Pattukottai and Peravurani areas said for most them coconut groves were the only source of livelihood. Nearly two lakh farm labourers are also estimated to depend on the coconut farms for employment in Thanjavur district. Peravurani is a panchayat town which is a leading producer of coconut. The town lying in new delta region is irrigated by Kallanai Kalvai and its distributories. Peravurani means "big pond", deriving from the Tamil words periya meaning big and oorani meaning a pond or a tank. The villages in and around Peravurani – some of which named as - Thirupooranikadu, kalagam, kondraikadu, thenangudi, hiruchitrambalam seruvaviduthi, uppuviduthi, Mudachikkadu, kalanikkottai, Kuruvikkrambai karambakkadu , Nadiyam, Marungappallam, Nattanikottai, Kazhanivasal, Rettavayal, Ottangadu, Sethubavachathiram – and more have been devastated by the cyclone with coconut trees, plantain trees, maize and paddy have been badly damaged. Electric poles have fallen – there has been no electricity and many people are suffering without food and basic amenities. It is our duty to ensure that we participate in some relief measures and help our brethren in these areas – whatever listed out here is limited and practically, there could be hundreds of villages badly affected and thousands waiting for some assistance.